In terms of flagship supercars, there are few with quite so much resonance with car enthusiasts as the Audi R8. 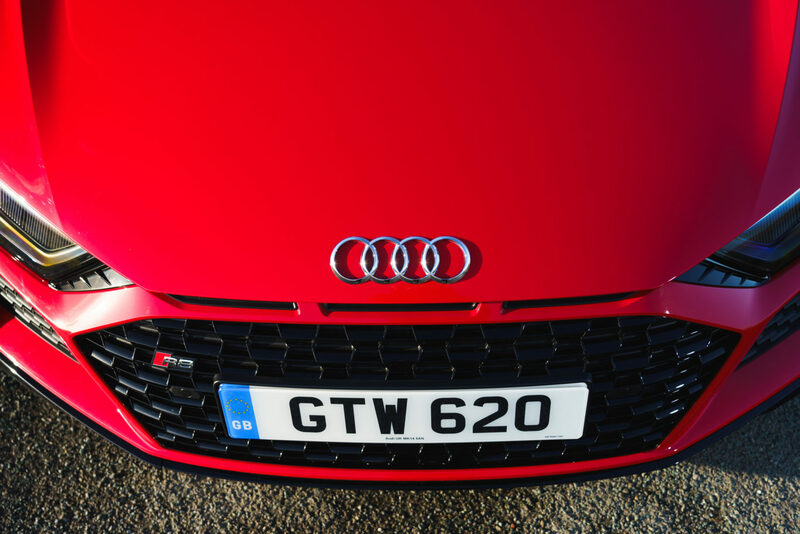 Since 2007 it has sat at the very top of the Audi food chain, and has gone from a V8-powered sports coupe into a fully-fledged, red-blooded supercar. Now, the German firm has seen to update it, throwing more power into the mix as well as tweaked looks and some cutting edge tech. We’ve hit the road with the tip-top Performance version in drop-top Spyder specification. The new Audi R8 boasts more power than the car it replaces, but we’ll have a look at that in a little more depth later on. You may notice that there’s no ‘Plus’ model available anymore either; that’s because Audi has decided to give its latest top-spec R8 models the Performance moniker instead, bringing it closer into line with the rest of its RS models. There’s also a new grille up front, above the whale-shark-mouth main intake. Audi says that it’s there to link the R8 with humbler models like the A1. Would you want your £180,000 supercar associated with a little hatchback? We wonder. The R8 uses a mesmerising 5.2-litre, naturally aspirated V10 engine. In truth, it’ll likely be the last time that we see such a thing, with the push towards electrification meaning that engines of this size will be phased out – and that’s a sad thing indeed. In Performance spec, it pushes out 612bhp and 580Nm of torque, figures which belie the character that this unit has. In true Audi fashion, all that power is sent to all four wheels through a quattro system, and it’s driven via a seven-speed dual-clutch S tronic gearbox. 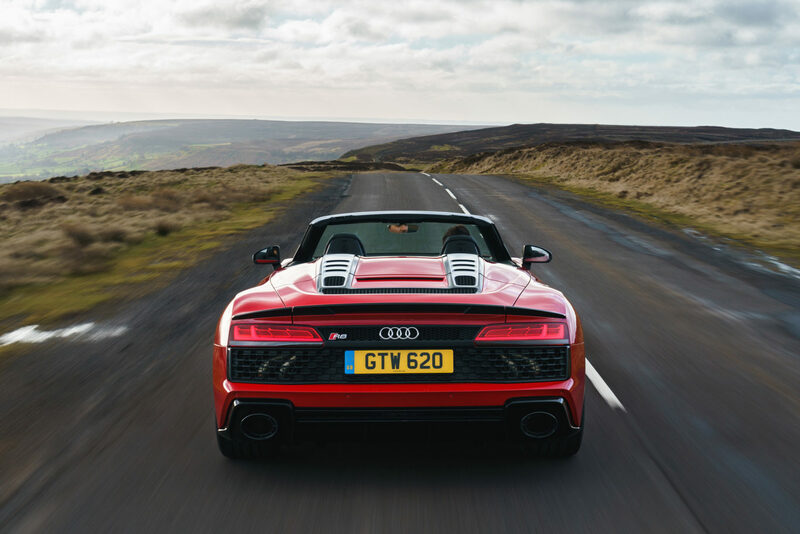 Audi was quick to point out that the V10 is now fitted with a petrol particulate filter, meaning cleaner emissions. But make no mistake, this is no efficiency wagon with its claimed consumption figure between 20.9-21.1mpg and a hefty CO2 output of 302g/km. 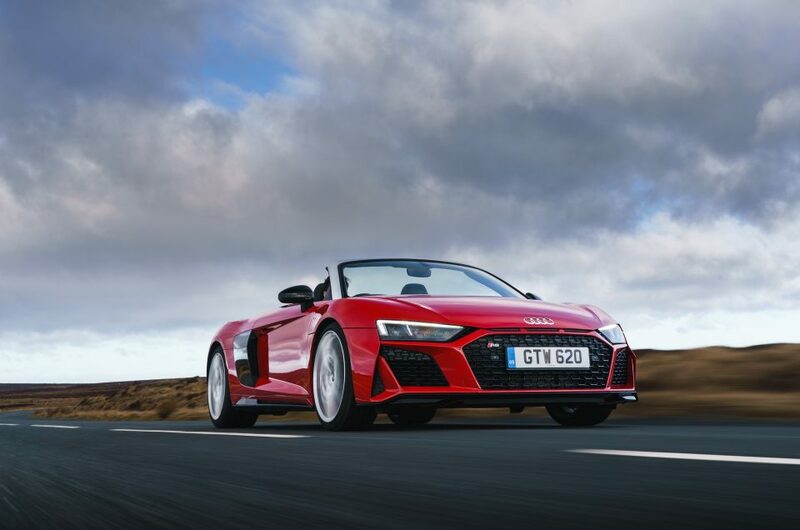 Get behind the wheel of the R8 Spyder and there’s one thing you immediately notice – that there’s not all that much room. The folding roof really reduces the cabin space, meaning that even average-sized drivers can feel a little cramped. It’s a small niggle but it’s one which makes a big impression, especially when compared to the Coupe. The whole experience is impressive though and dominated by that engine; throttle response is razor-sharp, and you’re rewarded with each millimeter of pedal travel with one of the very best exhaust notes in the business. It’s also properly, addictively and savagely fast – just what you want from a supercar. The steering does feel quite light for such a car, even in dialed-up-to-11 Performance driving mode. The suspension, meanwhile, gets better the faster you go – at lower speeds it can feel unsettled by larger bumps. 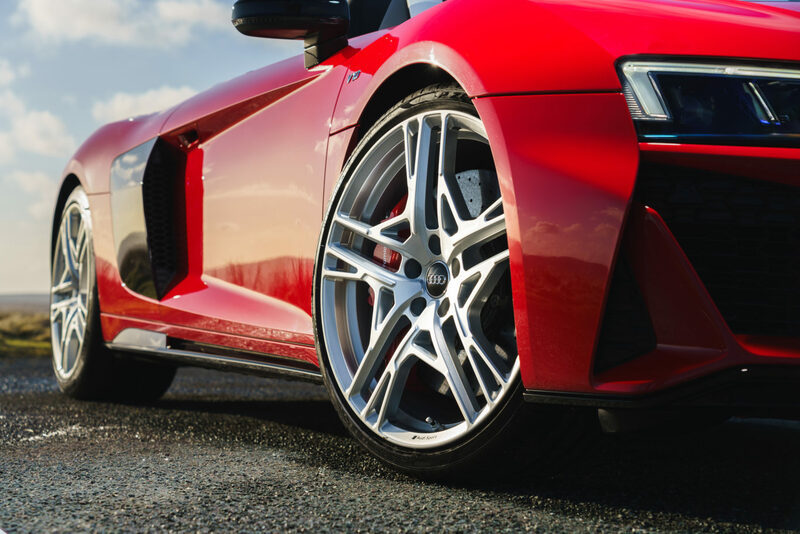 When it comes to turning heads, there are few cars quite as accomplished as the R8 Spyder. With a myriad of carbon elements, contrasted by silver accents on our test car, it screams to be noticed – as if the wailing exhaust note wasn’t enough to grab your attention. The intakes at the front of the car are a bit of an unnecessary addition, but the full-length rear grille section does really look rather good, and sit above two new oval-shaped exhaust pipes. Speaking of exhausts, Audi has done away with the steering wheel-mounted button allowing you to open the exhaust valves fully – now, they’ll open in certain driving modes but it’s something we would’ve preferred left alone. Compact driving position aside, it’s hard to fault the R8’s cabin. The general fit-and-finish levels are spot-on, and the central controls for the heating and ventilation systems – with their integrated displays – feel good to use and are great to look at too. Could we do with a little more flair from a supercar interior? Perhaps. It still feels a little like you’ve stepped inside an elongated TT, but we’ve always praised the littler car’s cabin. The only issue we had with the general build quality was a squeaking coming from the folding roof section behind the passenger. Solvable? Almost certainly, but not something you’d expect from a car knocking on the door of £200,000. As you’d expect from Audi’s top-of-the-range supercar, the levels of standard equipment are high. However, that’s not say that there aren’t ways of bumping up the car’s price by ticking some options boxes – there are more than enough of those. Our car started at a still considerable £164,790, but finished up at a hefty £182,445 thanks to several high-end extras. A full Laser Light upgraded headlights package topped the bill at £3,150 extra, followed up by a full leather package at £2,900 and Audi’s magnetic ride suspension system for £1,700. Carbon door sills threw another £1,500 on the bill, and even the interior contrast stitching added a further £650. It’s a shedload of money to add to an already pricey car, but it does mean that those who want to personalise their R8 even further have the option to. 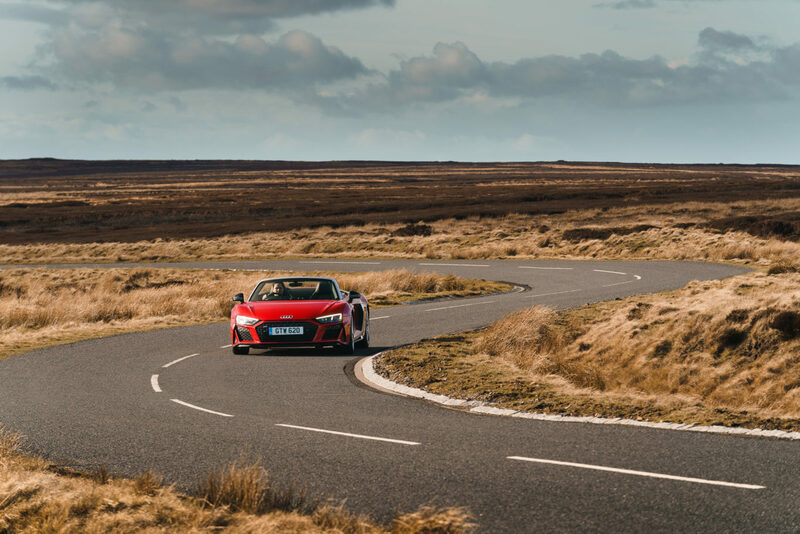 The R8 has become a way of elongating the life of one of the very best engines we’ve ever seen. It’s sad that it won’t be around for much longer, but the fact that it’s here for now in this updated R8 is something worth relishing. Expensive, yes, but in order to get your hands on one of the last naturally aspirated V10s, it’s worth it. Other supercars may be more capable of involving the driver in what’s going on, but few put a grin on your face quite like the R8.